Two more students have stepped forward to defend Concrete School District teacher Mary Janda’s claim that she did not make statements of religious intolerance last October, bringing the total number of students corroborating Janda’s version of the incident to four. The students, who spoke with Concrete Herald March 30 on condition of anonymity, said they could understand why the misinterpretation occurred. “A lot of times in those classes, people won’t listen. They’ll hear what they want to hear, and then try to debate it,” said one of the students. The other student described the course of the discussion, which had centered on bullying. A student had mentioned Hitler as an example, and the conversation moved from there to the Taliban. “Someone brought up Muslims and said they raise their children to kill. Mrs. Janda said, ‘No, no, no.’ The student perceived it wrong. She thought that Mrs. Janda was saying Muslims raised their children to kill. Mrs. Janda never said anything about Muslims raising their children to kill. We were talking about certain groups that do that,” said the student. In February, two other students posted messages on Facebook in support of Janda’s recollection of the discussion. On March 25, Concrete Herald spoke with two Concrete K-8 teachers who are familiar with the student’s writing style, vernacular, and competency level. Speaking on condition of anonymity, both teachers stated that the writing sample was not written by the student, as CAIR-WA claimed it was. Two school administrators who know the student also were shown the thoughts statement and stated it was highly unlikely it had been written by the student. The administrators also spoke on condition of anonymity. The discovery and the statements made by a growing number of the student’s peers who were present during the discussion casts doubt on the veracity of both the student’s claims and CAIR-WA’s claim that the writing belongs to the student, and came on the same day that CAIR-WA barred Concrete Herald from interviewing the student. CAIR-WA got involved after one student’s father—a converted Muslim—heard his child’s version of the discussion and complained to the organization. CAIR-WA contacted the school district in November to inquire about the incident. Hawkings’ brief response “pretty much dismisses our complaint altogether,” said Gist at a Feb. 19 press conference CAIR-WA called to announce it would seek a Dept. of Justice investigation. Janda has maintained from the beginning that the student who touched off this series of events misinterpreted her remarks. In a prepared statement, Janda said that “The point I was attempting to make was the connection that people who intend on imposing their will on others are bullies … I was very clear I was not talking about Muslim believers or Arabs in general, but people who were trained to kill, groups that bombed and attacked people, and did not care that innocent people were being killed. More than 450 people—about half of them from Concrete and other Upper Valley communities—filled the Concrete Assembly of God Church the evening of March 19 in support of Janda. 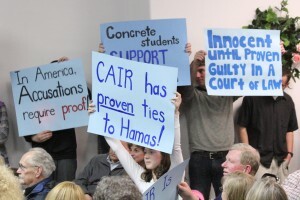 The rally also was designed to take a closer look at CAIR. Speaking at the rally was ACT! for America Washington Director Kerry Hooks, who was joined by Shahram Hadian, a former Muslim and founder of the Truth In Love Project. Hadian also was a candidate for governor in last year’s primary election. ACT! was invited to speak in Concrete after Arlington community organizer Eric Archuletta—who has been working with the grassroots group Imagine Concrete since 2008—learned of the allegations against Janda and gathered a group of 14 concerned local citizens to discuss CAIR and what should be done to protect Janda’s reputation. The group voted unanimously to counter CAIR’s public relations efforts by inviting ACT! to get involved in the situation. The sometimes emotional rally was tempered by the messages presented by Hooks and Hadian, who stated they were there to expose CAIR for what it really is. About 60 people attended a March 24 meeting at Concrete Center. 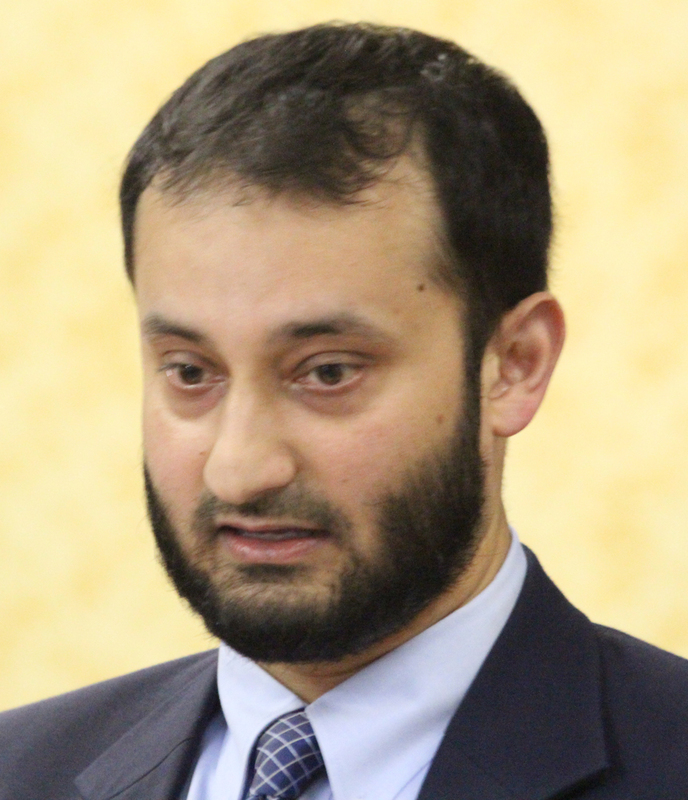 Hosted by CAIR-WA’s Executive Director Arsalan Bukhari and Civil Rights Coordinator Jennifer Gist, the forum was designed to be a “heart to heart conversation with community members,” according to a press release from CAIR-WA. Gist explained CAIR’s involvement with the case, stating that according to the student, Janda compared Muslims to Nazis. Bukhari and Gist fielded a slew of questions during the two-hour meeting, with many of them focused on CAIR’s funding sources and agenda. At one point, attendee Linda Jordan, a teacher at Skagit Valley College, grew frustrated with the tone of the conversation and pleaded with the group to stay on point. “Our intention is not to stay involved in this community beyond the resolution of this case,” said Gist. CAIR-WA Executive Director Arsalan Bukhari speaks during a community forum hosted by the Seattle-based Muslim rights organization in Concrete March 24.